Beginning Monday, November 10th, The Acorn will be week for “Meatless Monday” and will be launching their new Late-Autumn menu. 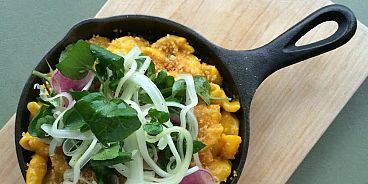 Every week on Meatless Monday, The Acorn will feature a unique take on Mac and Cheese, in addition to the regular menu, to usher in the Fall and Winter seasons. The Acorn’s interpretation on the North American comfort classic uses a traditional recipe as the backbone for experimentation and embellishment with local and seasonal vegetables. The Mac and Cheese special, which will take the form of “The Harvest,” will be available exclusively on Mondays and will be modified week to week while remaining faithful to the nostalgic elements that create the truly classic dish. Additionally, there will be vegan and gluten free versions of the dish. The Acorn is excited to be open for Meatless Monday, an international movement started in 2003 to improve the health of the individual and the planet.